If you just looked at the photo above and said to yourself, "just another 4-bay NAS review" you're wrong. I'll admit that initially, that's what I thought, too. Even ASUSTOR's product chart, shown below, would indicate that the AS4004T is a relatively low-end NAS. In fact, looking at our NAS ranker for RAID5 NASes sorted by price, you'll see that there are seven 4-Bay NASes that cost less than the current price ($379 at Amazon) for the AS4004T. For that price, it has to have something special and turn in great performance numbers. That something special is a built-in copper (10GBASE-T) 10 GbE Ethernet port. 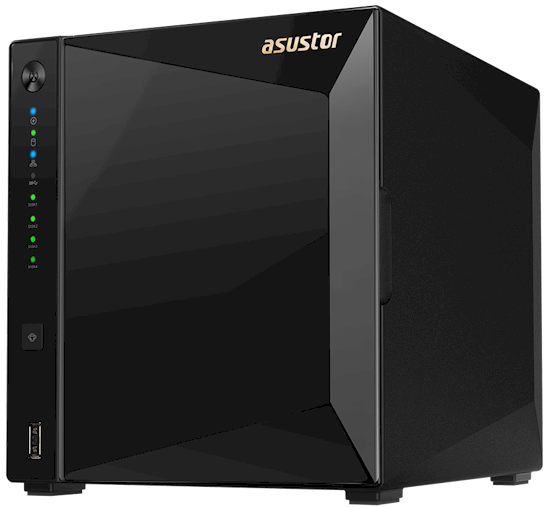 ASUSTOR also makes a two bay version of the product, the AS4002T. For this review, we'll be looking both at Gigabit performance as well as 10 GbE performance. I'll be comparing the AS4004T with QNAP's TS-471-i3-4G. I chose the QNAP NAS as it was the next higher-ranked NAS in our current chart of 10 GbE products. Note: Our 10 GbE charts previously had more products, but some of those products have been discontinued so were archived and removed from the NAS Ranker. The feature comparison below shows the QNAP NAS has a significantly more powerful processor, more memory, expandable memory, and two PCIe expansion slots. It also costs more than three times as much. The chart below, generated from our NAS Finder, shows a top-level comparison between the two NASes. Note that the AS4004T only has 2 GB of RAM and can't be upgraded. It also has only two USB 3.0 ports, compared to the QNAP's four ports and lacks any PCIe expansion slots. One interesting feature, however, is the link aggregation on the AS4004T. If you don't have a 10GbE capable switch, you can use the 10GbE port in conjunction with the two GbE ports to create a 3 GbE link to a compatible switch. You can look at a complete features comparison here. The callouts below show the front and rear panel of the AS4004T. There is a front panel USB 3.0 port but not a USB copy button. The rear panel has two Gigabit Ethernet ports, one 10 GbE and one USB 3.0 port. The photo below shows the main board along with two of the drive backplane slots. The table below summarizes the key components for the AS4004T. The NAS was difficult to disassemble, so we didn't. But we managed to see most of the key component part numbers. Power consumption with four SmallNetBuilder-provided WD Red 1TB (WD10EFRX) drives was 27W (active). Though drives were set to a 5 minute idle power down, the drives didn't power down even when the network cable was pulled. Fan and drive noise was rated as very low with no audible fan noise. RAID 5 rebuild for a 4x1TB volume was ~ 2hour and 45 minutes. RAID 10 rebuild for a 4X1TB volume was ~ 3 hours. As with all current ASUSTOR products, the AS4004T runs ASUSTOR's ADM 3.0. You can download the comprehensive ADM 3 user's guide here. If you want to take the user interface for a spin, ASUSTOR's online demo will let you check out many, but not all of the features. The screenshot below shows the ADM 3 landing page. The App Center has an extensive library of apps that can be downloaded and run. Services allows you to enable/disable services and configure ports for each service. Settings has a tabbed menu system that allows you to configure most settings. ASUSTOR also has a full suite of mobile applications that work with ADM 3-powered NASes. Firmware version 3.2.1.RKU4 was loaded onto the AS4004T and performance tests were run using the Revision 5 NAS test process. All tests were run using Western Digital Red 1 TB (WD10EFRX) (x4 SNB supplied). The primary focus of this review is about the 10 GbE performance of the A4004T and how it compares to the QNAP TVS-471-i3-4G. As we've pointed out in many reviews, NAS performance is often limited not by the ability of the NAS to handle a heavy load, but rather the limit of Gigabit Ethernet and a single client. If you want to break the 1-Gigabit barrier, you need to use multiple clients, enable link aggregation on the NAS ports and connect through a switch that also supports link aggregation. Or you need to move to 10 GbE. Although 10 GbE will cost more for both NAS and client, this method supports higher throughput with a single client with no link aggregation required. Note: During our backup tests to an external drive formatted for FAT32, we experienced the errors below. Since the tests didn't run to completion, FAT32 results were not included in our benchmark scores or in our Ranker ratings. We experienced the same FAT32 backup error when we tested the ASUSTOR AS3102T. To get a feel for how the five 10 GbE products in our charts performed, I created a chart for 10 GbE File Copy Write and 10 GbE File Copy read. For File Copy Write, the AS4004T was fourth and at 298.8 MB/s had only about 55% of the throughput of the TVS-471-i3-4G. For File Copy Read, the AS4004T was the slowest NAS of the five products in our chart. The benchmark summary composite chart below shows only the 10 GbE test results run using a single 10 GbE client. If you want to see the complete results including the Gigabit Ethernet tests, you can click here for the AS4004T or here for the TVS-471-i3-84 results. Looking at the chart below you can see that the QNAP TVS-471-i3-4G outperformed the ASUSTOR AS4004T for most, but not all tests. But for many of the tests, the ASUSTOR AS4004T turned in results in the range of 300MB/s, so clearly it has enough CPU power to take partial advantage of the 10 GbE connection. Some time ago, we created a separate class for RAID5 10GbE NASes. The chart below shows the five current 10GbE capable NASes. Since there are only five NASes, I decided to leave the results sorted by Rank. The NAS Ranker shows that the Synology DS1517+ still has our #1 with the ASUSTOR AS4004T being the #4-ranked NAS. For the 10 GbE category rankings, the QNAP TVS-471-i3-4G outperformed the ASUSTOR AS4004T in every category except for Video. For the Video category, both NASes were tied with a #3 ranking. Our NAS Ranker only allows a product to belong to a single class, so it's difficult to see how an individual 10GbE NAS might compare to all other RAID5-cable NASes with only a Gigabit connection. Since the AS4004T has a price that puts it well below even the next most expensive 10GbE-capable NAS, we temporarily classified the AS4004T as a RAID 5 class NAS to see how it would compare. The chart below shows the top five RAID5 NASes, sorted by rank, as though the AS4004T were only a RAID5 class NAS. As you can see, the AS4004T would be the #2-ranked RAID5 NAS and none of the other less expensive NASes have a higher rank. That makes it the best value for a 4-bay NAS. The chart below shows the category performance ranking of the AS4004T, as a RAID 5 NAS, compared to the #1 ranked Synology DS918+. The DS918+ won all of the categories except for the Backup and iSCSI categories where the two NASes were tied. Discounting the AS4004T's 10GbE port and treating it like a standard RAID5-class NAS, the AS4004T is the best performing 4-Bay NAS in our charts. The #1 ranked DS918+ has 5 bays and supports SSD caching, but also carries a $160 premium. But the AS4004T does have a 10GbE port and that puts it in a class with significantly more expensive NASes that have features such as PCIe expansions slots, expandable memory, and support for SSD caching. Not surprisingly, when matched up with NASes that have beefier hardware and cost three to four times more, than a RAID5-10GbE class NAS, the AS4004T only ranked #4 of 5. Still, the AS4004T had enough CPU power to achieve some benefit from a 10 GbE connection. If you're looking for a top performing 4-bay NAS, the ASUSTOR offers the best performance as compared to other Gigabit NASes. If you're looking to maximize your investment in a 10 GbE environment, other 10 GbE capable NASes offer significantly better performance, but also carry a significant premium. ASUSTOR let us know the 2 bay AS4002T has optimized 10 GbE RAID 1 read performance that they claim can reach "nearly 400 MB/s". They also advise that if configuring the AS4004T for RAID 1, users should select drives 1 and 3 or 2 and 4 to construct the volume. (Slots 1 and 2 share one SATA device and 3 and 4 share another. So alternative drives ensures each drive gets full SATA bandwidth.